Cooperstown. There is truly nothing else quite like that place. It may sound hokey if one were to describe it as special, but that may seem so to someone who has not made the trek to the Baseball Hall of Fame. 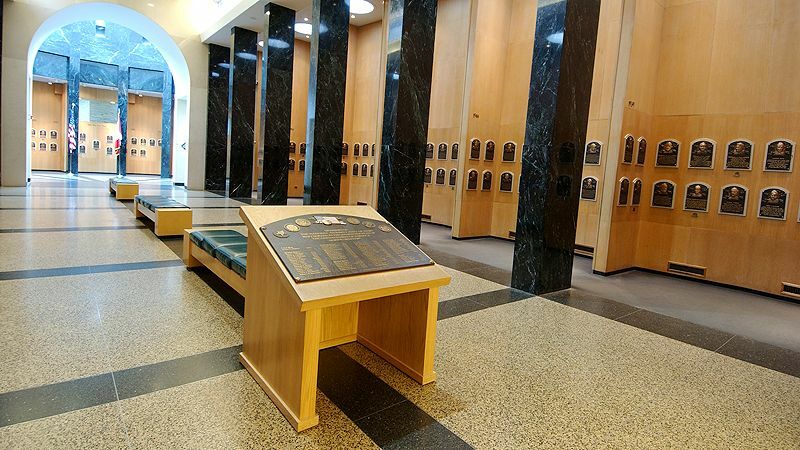 Only the game's greatest will end up enshrined in the Hall and thus it is a shame that we have some of the biggest hacks in journalism who get to decide who goes in. On that note, what players would be on my Hall of Fame ballot were I to have one? There is a good chance that Biggio is the only player inducted this year, considering there is also a real chance that nobody gets inducted because you writers with look-at-me ballots that are blank or with only one guy. But to me, the Biggio case is a fascinating one because he has a good case on the traditional standpoint due to his 3,000 hits but it is close on the new age statistical front, although the fact that he played well at every position the club asked him to. He was a key face of the franchise during the team's great years and if you break it down for each position, he's right at the standard. He deserves to get in. Now this is where it gets fun. Did Bonds use steroids or some other type of PED? I think he probably did, although as every defender will say, he never failed a test. And honestly, my opinion on the alleged steroid users has evolved over the years. Everybody knew that steroids and PEDs were out of control in the late 1990's into the 2000's, the media knew it, the front office executives knew it, the fellow players knew it, everyone knew it but nobody went seriously public with it because the league was still digging its way out of the 1994 strike and the home run chases brought positive press to the sport. It isn't fair to say that every player was using but this was the "Wild West" days of baseball, as Jay Jaffe refers to it, to where there were not even serious suspensions for using steroids. Back to Bonds, the rumors trace back to 1998 but if you take out the numbers after that time, Bonds is still a Hall of Famer. Yes he did probably cheat the sport but it was not like he was pulling a Brady Anderson with his power coming out of nowhere and he would be far from the only bad apple in Cooperstown. The Clemens case is similar to Bonds' in that he probably did use, although it has not been proven via a negative test. The evidence is there and thus it is hard to try and prove that he never did. But also like Bonds, the allegations predate testing and came in the league's "Wild West" era where everybody knew something was going on and nobody said or did anything about it. So like Bonds, we have to look at his career prior to when the allegations allege that usage begins, if Clemens' numbers after 1997 were wiped out, he is still a clear Hall of Famer. Essentially, the case against Martinez is that he spent much of his career as a DH and did not have to play in the field. Never mind that Paul Molitor (Class of 2004) spent much of his career as a DH and he was inducted in his first try. Plus, not only are Martinez's numbers better than Molitor's, but Martinez was not moved to DH because he was an awful fielder, he actually was a decent guy at the hot corner with the glove, but because of injury issues that he had early in his career. I do understand the reason why a DH is at a disadvantage in terms of the Hall, but it really would be a shame to withhold one of the elite hitters because of it. What will likely hurt Schilling's case is the fact that he had a (well-deserved) case as a malcontent, as well as the fact that he did not get to 300 wins and never won a Cy Young. Never mind that playing on some awful Phillies teams hurt his win total. Anyways, while Schilling may not have the wins, his extraordinarily good strikeout numbers are what put his case over the top as he is third all-time strikeouts-per-nine with over 3,000 innings and his total of 300 strikeout seasons which put him in rarefied air. What also makes him deserving was his great success as a postseason pitcher, as he went 11-2 in postseason starts (4-1 in the World Series) and led his teams to four pennants and three titles. That is my ballot. Yes I do not have a full ballot as my ballot has nine guys but that is because I had a tough time making a significant case for a tenth guy. Here are the guys that did not make the cut. Lofton came closer than you would expect to being on my ballot and a reason why I think that many are not taking him more seriously as a candidate is because he was such a journeyman late in his career as well as the fact that he was always pretty underrated during his peak years. The advanced statistics leave him a little shy but he does greatly take advantage of being an awesome field in his best years. McGriff is a guy that folks want to be in the Hall of Fame when you have guys getting on the ballot with ties (some legitimate and substantiated, some absolutely ridiculous) to performance enhancing drugs (Dale Murphy is the same way). But save for his home run totals of 493, which would look great a couple decades ago but in the greater offensive era, it doesn't look that impressive, his resume is lacking because he was never considered an elite player (no MVP's, one top five finish) and was never much in the field. Morris has a reputation of being an all-time postseason pitcher, with Game 7 of the 1991 World Series being probably the greatest postseason pitching performance ever. And it has been on the back of that performance to where Morris has been steadily gaining votes towards a potential induction, getting to 66.7% last year. But you know what, if you vote for Morris, you almost have to vote for David Wells, who is one his first year on the ballot, because not only was Wells a very good postseason pitcher in his own right, his statistics are very similarly to Morris's and he has greater values in WAR and Jay Jaffe's JAWS, which is a combination of career and peak WAR. Murphy's case is that the peak years of his career are Hall of Fame worthy but the downfall in the resume is that he had a short peak and fell off dramatically after he turned 31. When you use advanced statistical metrics to determine his case, he does fall short and it really is not that close. That said, considering his prime, if he were to somehow find his way to the Hall (highly unlikely, but hear me out), I would not carry a torch and pitchfork and riot in Cooperstown. Actually, I would never do that anyways because I absolutely love Cooperstown and have been wanting to go back for years. Honestly, I came closest to having Walker on my ballot of anybody else on the ballot and the biggest reason why I chose to leave him just short, even with an open spot, is not because of the fact that he spent much of his career in Denver but more because he struggled to stay healthy for the entirety of his career. And even then, using advanced statistics, he still is good enough to make the cut. Williams was a key piece of the Yankees' dynasty in the mid to late 1990's in the 21st Century and had himself a very good prime (hence some comparisons to Dale Murphy's Hall of Fame candidacy). That said, I find hard to take his profile for the Hall seriously. He was never a real candidate for AL MVP, which proves that he was very good without being great. And not to mention truly awful defense, no matter what those Gold Gloves try to say.